If I was trying to review books in the order I finished them, this one would be far down the list (I'm very behind with my reviews). But Thanksgiving is tomorrow, and this book just complements the holiday too perfectly not to share it right now. Ironically enough, towards the end of October, I was desperately trying to find a good readaloud for November. But in spite of scouring my to-read shelf plus looking to trusted sources, I just couldn't find anything that seemed like the right fit. 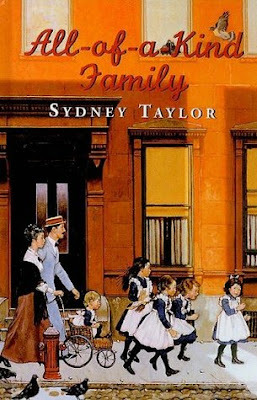 A couple of weeks later, someone mentioned All-of-a-Kind Family (not in the context of November or Thanksgiving--just mentioned it), which is a book I remember loving as a child. It had been on my radar as a potential readaloud for awhile, and when I remembered that we actually owned a copy of it so I wouldn't have to wait for it at the library, I thought, Why not? Very soon into the book, I realized with a start, Oh my goodness, I just stumbled on the perfect book for November, and I didn't even mean to! It's not that the Thanksgiving holiday itself plays any sort of part in it, but it's rich in food descriptions, traditions, family togetherness, and gratitude, creating just the right mood for this time of year. Ella, Henny, Sarah, Charlotte, and Gertie live with their mama and papa on the lower east side of New York City in 1907. They give themselves the nickname "all-of-a-kind family" because they only have sisters and no brothers, so they're all the same kind. Their papa owns a junk shop where he collects scrap metal and rags and paper. As you can imagine, this kind of living does not bring in the big bucks and money is always a little tight. However, the family is always well-fed and comfortable, and they never seem to mind that their home is small and their pocket change measly. At first glance, this might not look like the most interesting or accessible story to a family of all boys (turns out, we're also an all-of-a-kind family, but the opposite variety). However, my kids loved every single thing about this book. They didn't care one bit that there weren't any brothers and found a surprising number of ways to relate to the girls (we all teased Max a little bit during the chapter when Sarah wouldn't eat her soup because she acted exactly the same way he does when he doesn't want to eat something, and he seemed quite pleased, rather than offended, by the comparison). But they also loved it because of all the differences between the girls' life and their own. For one thing, the family is Jewish and much of the book centers around Jewish rituals and holidays (the Sabbath, Purim Day, Seder, etc.). (Incidentally, even though there's no traditional Thanksgiving in this book, the Jewish holiday Succos, which is a "thanksgiving for the harvest," was celebrated and felt very timely.) My kids were fascinated and asked dozens of questions about how Judaism differs from our own religious beliefs and in what ways they're the same. All of the religious references were a natural part of the story, and as such, it didn't feel like we were having a lesson on Jewish culture, but the questions were springing up naturally because of their intense interest in the story. As I mentioned above, food is a major component of this story and is integrated into almost every chapter, whether Charlotte and Gertie are sneaking candy and crackers into their bed or Mama is making dozens of Haman taschen (a triangular shaped cake filled with poppy seeds or prunes) or they're at the market and Mama puts on an apron before she plucks the chicken she intends to buy (taking the concept of "self-service" to a whole new level). The descriptions were both foreign and familiar, making our mouths water and tempting us to try new recipes. Food is such a part of our own holiday traditions, and there was something so captivating about seeing how all these unfamiliar dishes (to us) had the same comforting, joyous effect on these little girls. And it wasn't just my kids who found things to admire and relate to. I felt a certain kinship with Mama who, although her life was much more exhausting than mine, expressed similar sentiments. When four of the girls come down with scarlet fever, I understood how overwhelmed she must feel as she tried to take care of all of them while still preparing for the Seder holiday. When she decides to take all of the girls to the beach in order to escape the August heat, I felt both anxious (so many little girls to keep track of in so many crowds!) and proud (she did it for purely selfless reasons because she knew they needed it). When she invented a game so that the girls would dust the front room more thoroughly, I caught a spark of hope--maybe I can teach the same kind of pride in their work to my own kids. Even with all that praise, I realize this story might not be for everyone. It is old-fashioned and slow-paced and might not hold the interest of today's children who are accustomed to more action and drama. However, I guess I'm raising old-fashioned kids because I heard nothing but love for this book while we were reading it. Reading a book about an all-girl family made me feel very possessive of my own all-boy family. We'll be finding out in a couple of weeks if we'll be adding another boy to our family or braving a whole new world with a girl. The end of the book was good for me because a baby brother joins the family, and Ella realizes, "We aren't an all-of-a-kind family anymore," but Mama replies, "In a way we are. I think that means more than our having five daughters. It means we're all close and loving and loyal--and our family will always be that." In spite of the changes coming to our family next year, whether they be big or small, I hope we'll also be exactly that. What are your thoughts about reading old-fashioned stories to your kids? Do you have any other old-fashioned books to recommend to us? I love this book so much. And hooray for all-of-a-kind families, no matter whether it's all of one gender or not. Oh, it's such a good one. And I imagine it's even more perfect for your family since you DO have all girls! I will be adding this to the list. A couple of questions. 1) what will your seasonal reading be for December? In case I want to steal your ideas. and 2) when do you do your reading aloud time? I find that with dinner, homework (which includes their reading aloud), and any other activities, we don't get to read much as a family out loud. I want to try to change that so that I can be reading some of these longer books. I have three books on the docket for December: A Christmas Adventure (which is Book 4 in the Tumtum and Nutmeg series), The Best Christmas Pageant Ever (I've been a little hesitant to read this one to them because the Herdmans are such naughty children, but I can't deny that I love it), and The Children of Noisy Village. And a couple of the readalouds we've enjoyed in past Decembers are: Nancy and Plum and The Family Under the Bridge. As far as when we read, I agree that it is tricky with homework and other projects to find a time to squeeze it in, but most of our reading aloud does happen in the evenings between 8 and 8:30. I'm pretty possessive of that time slot and try not to let other things encroach upon it. However, even when we're bumping up against 8:30 and I know they really should go to bed, I still read for about 10 minutes simply because our evening doesn't feel complete without it. Good luck--I know it can be such a challenge to find time for everything! Did you read all the sequels (I mean you as a kid, not as a family yet)? I loved these as a kid as well. When you read old fashioned books (or any book really), do you ever point out things that you disagree with? I read some of these with my kids, and I remember some casual references to things girls couldn't do or something, which was appropriate for the time of the book but not what I want my boys to assume, and I think I just made a face or changed tone a bit while making eye contact with my sons in a "we know better now, right?" kind of way. So it didn't interrupt the story, but I still made clear that I disagreed. WIth read alouds, sometimes I do want to make clear where I disagree, but usually not enough to disrupt the story. Unless it's something that matters a lot -- I think a hot button for me was families that were casually mean to each other (not a problem in this book!) and I might have thrown in a few comments along the way, because compassion was our family motto and I really wanted it to start at home. I possibly read All-of-a-Kind Family Uptown, but I don't remember for sure. And yes, oh yes, I point out things, talk about them, subtly change my tone of voice, or leave things out all together depending on the content.